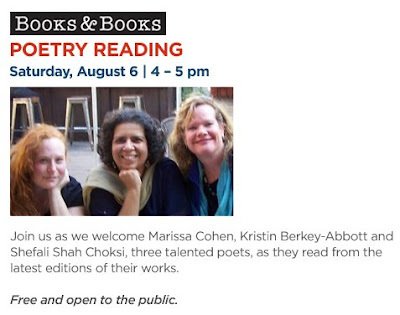 The Books and Books Poetry Reading on August 6th! August was a very exciting month. I had a chance to read from my forthcoming poetry book "Tricking the Goddess" at the independent bookstore Books and Books in the Fort Lauderdale Museum of Art. Joining me were fellow poets Shefali Choksi (Frontier Literature) and Dr. Kristin-Berkey Abbott, author of I Stand Here Shredding Documents and Whistling Past the Graveyard. Edmund Skellings, Poet Laureate of Florida said about the work featured in my upcoming Tricking the Goddess, "[Marissa Cohen's work is] powerful, both intellectually and emotionally." The evening was an amazing success and the Books and Books venue at MOAFL is light-filled and beautiful, an inspiration to any writer. A special thanks to the Books and Books staff for making sure we were taken care of. I felt like Anne Rice with that kind of attention! Want to learn more about poetry readings and other literary events? Sign up for our RSS feed on the right side of this blog and stay up to date.